"25 Years Studio", 1993, Signed by 8 Contemporary Artists, Gemini G.E.L. "Mr. Roy Lichtenstein", 1962, Exhibition Mailer / Poster / Invitation, Mi Chou Art Gallery/ Kennedy Gallery/ Leo Castelli Gallery NYC,. 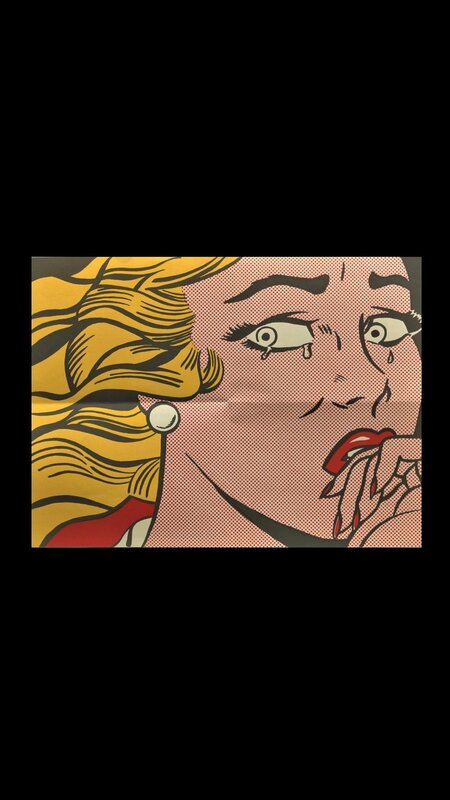 "Crying Girl", 1963, Exhibition Announcement,/ Mailer/ Poster, Leo Castelli Gallery NY. "DRAWINGS", 1963, Group Exhibition Announcement,/ Mailer/ Poster. “POP ART ONE”, 1965, Group Exhibit Catalogue, Institute of American Art, with “Explosion” Sticker by Roy Lichtenstein,. Featuring Warhol,, Lichtenstein, Johns, Oldenburg,,Rosenquist, Wesselmann. “Order Form- Ceramic Dinner Service.”, 1966, ,Serving Sets. "Compositions", 1967, Exhibition Catalogue, Pasadena Art Museum. 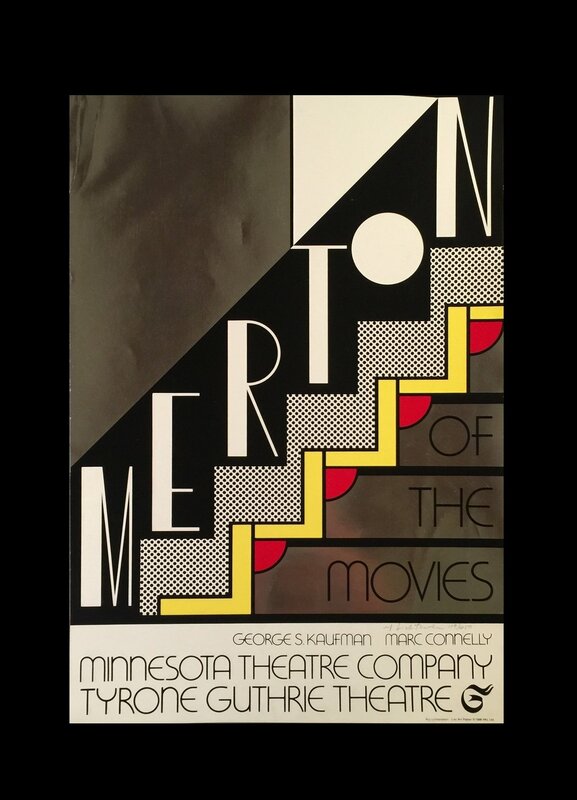 "Merton of the Movies", 1968, Signed Edition, Sonnebend/Castelli Estate. “Rouen Cathedrals and Haystacks”, 1969, Exhibition Announcement, Leo Castelli Gallery NYC, (image) 6,4 x 9.3 in. “REAL ESTATE”, 1970, Prints Announcement Card, (unfolded)11-1/2 x 11-1/2 in. (Image) 11-1/2 x 5-3/4 in. “STILL LIFES”, 1973, Exhibition Announcement, Leo Castelli Gallery NYC, w/ Envelope, 7 x 4.7 in. “THE ARTIST’S STUDIO”, 1974, Exhibition Announcement, , Leo Castelli Gallery NYC, 8.2” x 5.2 in. "LICHTENSTEIN", 1976, Exhibition Invitation/Poster, Kent State University School of Art..
"Art About Art", 1978, Whitney Museum Exhibition Poster. “ROY LICHTENSTEIN-PAINTINGS”, 1982,, Exhibition Announcement Parrish Art Museum NY. "The Mirror Paintings", Exhibition Catalogue, 1989, Mary Boone Gallery NY. “The Oval Office”, 1993, First Printing , Democratic National Committee, Poster, Published to help finance the Inauguration of Bill Clinton. “INSTALLATION ANNOUNCEMENT LICHTENSTEIN SUBWAY MURAL”, 2002 TNYC Transit Authority Advertisement, 29 X4 4 IN.